George Washington Plunkitt, the notorious leader of New York’s nineteenth-century Tammany Hall machine, famously insisted on a distinction between honest graft and dishonest graft. When acting from honest graft, a politician is simultaneously pursuing both personal interest (including the interest in being reelected) and the public good. Our constitutional system, as Madison, Hamilton, and Jay argued in the Federalist Papers, assumes that our leaders will not be angels but can be guided by self-interest to act in ways that, for the most part, promote the common good. For nearly two hundred years, we have set federal appropriations through congressional acts that included “pork-barrel spending” or “earmarks”: specific provisions that benefit the constituents of one or a few members. In the long run, nearly every district benefited from such provisions, and the pork-barrel method enabled citizens in far-flung regions to feel that they were full participants in and beneficiaries of effective self-government. The system was admittedly imperfect. At times it generated foolish extravagances, like the infamous Alaskan “Bridge to Nowhere,” and it undoubtedly created opportunities for truly dishonest graft, as in the case Randy “Duke” Cunningham, a former Republican representative of California, who pleaded guilty to receiving $2.4 million in bribes to direct earmarks to defense contractors. In addition, the sheer volume of earmarks can be burdensome and time-consuming. The number peaked at fifteen thousand in 2005, a volume that created significant backlog in congressional committees. As a result of the odd marriage of convenience between Tea Party Republicans and progressive Democrats, spurred on by the center-left Citizens against Government Waste (a vestige of good-government types left over from the failed Grace Commission of the 1980s) and the left-leaning Center for Public Integrity, Congress imposed a total ban on earmarks in 2011. To say the least, Congress’s track record in the seven years since the ban has been less than stellar. The real problems with earmarks are fixable. I will outline a five-point reform plan below, after laying out a three-pronged case for reviving earmarks: at the level of pure political theory, as a matter of American constitutional practice, and through reflection on our own recent practice and imminent needs. For the past fifty years, political theorists and public-choice economists have intensively studied the question of the best decision rule to use in the political domain, taking into account both efficiency and fairness. The ideal arrangement is to require unanimous consent on all decisions. The unanimity rule guarantees that the result is “Pareto optimal,” in the sense that it is impossible to find an alternative result that makes some better off without making anyone worse off. If such a preferred option were available, those who would benefit from the revised policy would not consent to the original one. Pareto optimality is what economists mean by an “efficient” outcome. In addition, a result that evokes unanimous consent would be a fair outcome, since anyone who was treated unfairly would withhold consent. Unanimous agreement, however, is an impractical standard to insist upon. In a large and diverse society, and even in a moderately large representative assembly, the negotiations required to reach an agreement acceptable to everyone (without exception) would be virtually interminable and hence quite costly. For this reason, most political systems settle for decision by majority rule, at least for everyday matters, as a reasonable approximation of unanimity. Of course, majority rule brings with it the danger of the tyranny of the majority, or majoritarian “factions” (as Madison terms them in Federalist no. 10). A tyrannical or factious majority is one that uses majority rule to impose an unjust result on the rest of the electorate. As economists have demonstrated, this is a special case of a more pervasive problem with majority rule. Majorities can support results that are not only unjust but also inefficient, i.e., Pareto suboptimal. This is because majority rule does not take into account the voters’ various intensities of interest in different issues. Under simple majority rule, a largely indifferent majority can approve a result that is intensely opposed by everyone in the minority. If out-and-out bribery were permitted, it would be relatively easy for the minority to bribe the majority faction to defeat the hated policy, and, since the minority does really hate the original proposal, both they and the majority would be, on balance, better off in the post-bribe situation. The original result of majority rule was not Pareto optimal. It was economically inefficient. In the real world, it is not necessary to buy votes, either of individual voters or their representatives. What we actually see as a part of normal democratic practice is a process of vote trading, sometimes called “logrolling.” Voter 1 cares deeply about issue A but not about issue B. It is then rational for voter 1 to trade his vote on B for voter 2’s vote on A. As a result, everyone is better off. Dennis Mueller, Geoffrey Philpotts, and Jaroslav Vanek demonstrated in a 1972 paper in Public Choice that the analogy between the efficiency of ordinary markets and the efficiency of vote trading in the political sphere is almost perfect.1 In nearly all cases, a system of logrolling will take a society to a state very close to Pareto optimality.Earmarks are merely a special case of logrolling. They enable political minorities (even a minority of one) to have an impact on policy, despite an apathetic or even hostile majority. Earmarks and other forms of logrolling have another advantage over simple majority rule: they significantly reduce the problem of voting paradoxes. It has been known since the work of the Marquis de Condorcet in the eighteenth century that when preferences are determined by simple majority rule, the result can be both illogical and unstable as a result of voting cycles. For example, suppose that we have an electorate consisting of just three voters who must choose among three mutually exclusive and jointly exhaustive options, A, B, and C (that is, exactly one must be chosen). Here is a table representing the preferences of the three voters. If each voter selects his top choice, all three options are defeated (a result that is illogical and cannot be implemented—suppose, for example, that option C is simply the absence of A and B). If each votes for his top two choices, all three options pass, a result that is equally absurd, since the three options are mutually exclusive. As Kenneth Arrow demonstrated in his famous Impossibility Theorem, there is no solution to this problem that achieves transitivity of preferences and avoids “dictatorship” (i.e., arbitrarily picking one of the three voters as the decider).2 A majority of two prefers A to B, a majority of two prefers B to C, and a majority of two prefers C to A, a vicious cycle. As anyone who has served on committees knows, this result is quite common. Voting paradoxes engender another problem, in addition to instability. Richard McKelvey proved in a 1976 paper that, where there are unresolved cycles of this kind, anyone who has control over the agenda (e.g., a committee chairman or presiding officer of the assembly) has absolute and unchecked power over the final result.3 By crafting the order in which votes are taken, the chairman can ensure whatever result he favors personally. For example, if the chairman wants C to win in the electorate above, he engineers first a vote between A and B (which A wins), followed by a runoff between A and C (with C winning). There is no universal solution to this problem, but suppose that vote trading were possible. In such a case, one of the three voters might switch his vote to the top choice of another voter, in exchange for the other voter’s support on another issue. Suppose, for example, that voter 1 thinks that the difference among options A, B, and C is quite small, while voter 2 desperately prefers B to the others. Some trade between 1 and 2 should be possible, if there are issues that 1 cares about but about which 2 is relatively indifferent. Some political theorists, including W. H. Riker and S. J. Brams, have argued that logrolling generates excessive government, leading to inefficient or suboptimal results.4 The gravamen of their case depends on the possibility of democratic redistribution of resources. The argument is as follows. Each representative would like to redistribute resources from the rest of society to his own district. This can be accomplished by earmarked government spending in one’s district, so long as the spending is paid for by taxes or borrowings that take resources away from other districts. Logrolling enables each representative to increase spending in his own district, since he cares deeply about the spending but is relatively indifferent to both the costs and the benefits of each individual project in any other district. In the long run, all of the local projects receive funding, with the result that total spending (and thus total taxing and borrowing) is much too high. In the end, everyone is worse off, since the value of each local project to the representative and his constituents is outweighed by the burden of paying for everyone else’s. Each individual political decision by each representative is perfectly rational, even though the end result is bad for everyone. This is a case of what is called “the tragedy of the commons,” pointing to the analogy of a community whose common grazing ground is horribly overgrazed, as a result of individually rational decisions by each farmer about how many animals to graze on the commons. The correct solution for government overspending is to impose some form of budgetary control. First, determine the optimal level of overall spending in each category, and then distribute the spending within each category by a combination of majority rule and logrolling. This procedure was in fact the one in place before the 2011 ban. Without realizing it, government reformers destroyed what was, from a public choice perspective, a nearly perfect system. As I will argue below, earmarks can help to make such budgetary controls more effective. The free use of earmarks is in a fact a valuable tool for controlling and limiting spending. Article I of the Constitution of the United States invests the power of the purse, the power to control and direct government spending, exclusively in the hands of Congress. It is true that in the eighteenth and early nineteenth century, Americans believed that the federal government should not be involved in funding any project of merely local significance. President James Monroe wrote that the federal government should support “great national works only, since if it were unlimited it would be liable to abuse.” There is a lot to be said for such a view, but it seems impossible now to put this genie back in the bottle. For the foreseeable future, the federal government will be spending money in every state and district. The only question is, Who shall control that spending, Congress or the executive branch? It is ironic that the Tea Party, which had begun as a movement to restore founding constitutional principles, should have been instrumental in bringing about a change that takes us further away from our original constitutional design, giving administrative agencies and career civil servants in the executive branch power that rightly belongs exclusively to the Congress. According to John Hudak at the Brookings Institution, President Barack Obama used executive earmarks to direct federal spending to key swing states before the 2012 presidential election and before the 2014 midterm election.9 If the honest graft of pork-barrel spending is banned from the legislative branch, it will simply find a new home in the executive. Surely no one would argue today that the executive branch is too weak relative to the legislative. Quite the contrary: that balance has shifted considerably in the executive direction. If the Congress is to resume its proper role as the architect of law and director of national policy, it must be able to function effectively. Historical experience demonstrates that this is possible only when legislative leaders (the Speaker of the House, the Senate Majority Leader, and their lieutenants) are able to forge and maintain a majority coalition. Earmarks enable leaders to maintain party discipline within Congress, since those leaders can threaten the obstreperous with the loss of their earmarks. The two-party system is foundational to our political constitution as it has been practiced for over two hundred years. Competition between two distinct parties gives real power to the people. 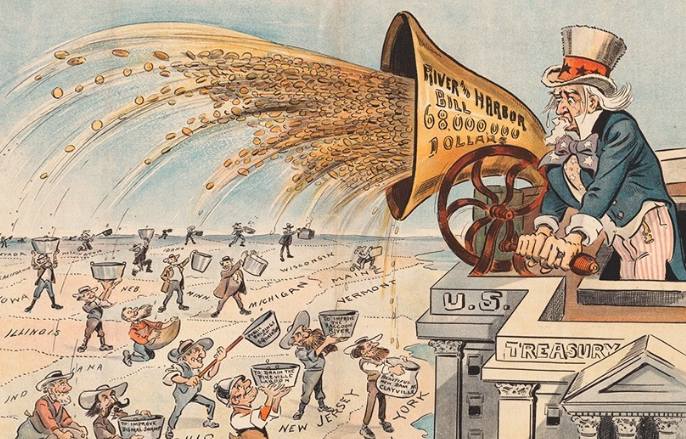 The great political sociologists of the last century, including Vilfredo Pareto, Robert Michels, and James Burnham, document what Michels termed the “iron law of oligarchy.”10 In a large democratic republic, real power is concentrated in the hands of those who run effective and well-funded political organizations. As Michels put it, “Who says ‘organization,’ says ‘oligarchy’” (i.e., the rule of the few). The only way to return power to ordinary people is through what Pareto called “the circulation of elites.” The people must be given the power to choose between two competing sets of elites, turning one set out of power and putting the other in, based upon the degree to which each set best satisfies the desires and aspirations of ordinary people. Without party discipline, we would be left with a “two-party system” only in name. Congress can easily devolve into a mob of 535 politicians, each with his or her own idiosyncratic set of priorities. In a parliamentary system like that of Canada or the United Kingdom, party discipline results from the unification of legislative and executive elections: voters cast a single vote for their local representative and the head of government. If the government loses any major vote on legislation, the government “falls” and a new election immediately follows. The American system, with its strict separation of executive and legislative branches and fixed schedule of elections, lacks any of these measures for maintaining cohesive parties. Earmarks and other forms of logrolling provide the necessary glue. The political chaos in Congress that results from the absence of earmarks leaves the public with no way to hold national parties accountable for coherent policies and for concrete results on a national level. In such a world, congressional elections become mere popularity contests, subject to manipulation by media and special interests, with no consistent and intelligible relation to policy and results—at least, no relation that the average voter can grasp. In contrast, a choice between two coherent and disciplined parties gives the average voter real leverage over the political class, leverage that translates in the long run into effective popular control. Earmarks are especially important as a means for party leaders to build centrist coalitions, resisting extortion from either extreme. This is especially important when Congress is both polarized and almost evenly divided. Earmarks can enable the majority leaders to secure enough allies to avoid defections, either from their own extreme fringe or from centrists in the other party, and thus to secure a majority vote on indispensable legislation. In fact, Mueller, Philpotts, and Vanek demonstrated that the expected gains in efficiency from vote trading are greatest when the assembly is almost evenly divided (the minority close in numbers to the majority) and when the two sides are highly divergent in their interests—that is, exactly under the conditions of a polarized and evenly divided government that are current today. The ban on earmarks has not been effective. Observers of Congress have dubbed the recent process of “lettermarking” as the new means by which congressional members fine-tune federal spending. Instead of adding an earmark to legislation, members of Congress are simply writing letters to the heads of executive agencies, soliciting funding for local projects. The end result is similar in fiscal terms, but lettermarking is inferior to earmarking in at least two respects: lettermarking doesn’t help to cement effective legislative coalitions, and it is much less transparent, and so more subject to abuse. Earmarking was never a driver of excess federal spending. At their peak, earmarks in 2015 represented just 0.4 percent of total federal spending. Skeptics have argued that the legislative gridlock and inactivity caused by the earmarks ban is not a bad thing. The idea is that our checkbooks are safe for as long as Congress is disabled. This simple-minded reasoning, however, overlooks the fact that the vast majority of federal spending is on automatic pilot— spending for entitlement programs like Medicare, Medicaid, and Social Security. Entitlement spending is currently 60 percent of all federal outlays, destined to grow to 75 percent in 2024 if we do nothing. To change our fiscal future requires new legislation: the most significant increases in spending will not be derailed by legislative gridlock. After their surprising victory in 1994, when Republicans regained control of the House of Representatives for the first time in forty years, Speaker Newt Gingrich and Majority Leader Tom DeLay used earmarks with great creativity and skill to defend and increase the Republican majority. Traditionally, the only congressmen able to introduce earmarks were committee chairmen, members with great seniority and safe districts. Newt Gingrich and Tom DeLay inverted this practice, putting freshmen congressmen in vulnerable districts on the appropriation committees, with opportunities for earmarked spending. The number of earmarks increased astronomically (up 940 percent from 1995 to 2005), but total spending on earmarks actually declined. Republicans were thus able to secure much more political bang for the buck. Eliminating earmarks was not only bad policy but, for Republicans, also bad politics. In 2010, Republicans allowed themselves to be railroaded into a self-destructive act of unilateral disarmament vis-à-vis the Democrats, adopting a ban on earmarks that could be immediately reversed by the next Democrat-led Congress. If the ban had been made permanent, applied via a constitutional amendment to all future Congresses, then at least it could be defended as politically neutral. Republicans were, however, astonishingly foolish to impose political disabilities upon themselves without extracting any concessions from their opponents. The earmark regime prior to 2011 was far superior to our current practice, but there was genuine room for improvement. Here are five quite feasible reforms that would both improve the earmarking system and make it easier for politicians to defend lifting the ban. Limit earmarks to appropriations bills that come in under budget. Limit earmarks to appropriations bills produced in the normal way, through appropriation committees. Keep the ban on earmarks added to omnibus spending bills or continuing resolutions. Limit earmarks to projects vetted by public hearings before the appropriate committee or subcommittee. Require prior approval for each earmark from the majority party leader (or his designated agent). Limit the total number of earmarks per representative per year—for example, four per member per year (around two thousand total). By limiting earmarks to bills that come in under budget (proposal 1), we provide an incentive to all members of Congress to keep total spending under control. Earmarks then become a weapon against fiscal irresponsibility. In only three of the last fifteen years has Congress been able to pass appropriation bills for the distinct sectors of the government in what is known as “regular order.” In place of this orderly process, Congress has just managed to avoid catastrophe through a series of continuing resolutions and omnibus spending bills. These emergency measures deprive the president of the opportunity to veto excessive appropriations. The president faces a take-it-or-leave-it offer: either sign the massive bills or throw the nation into fiscal chaos (the so-called government shutdown). Proposal 2 provides members of Congress from both parties with a powerful incentive to work together in a more seemly and orderly fashion. Abuses like the “Bridge to Nowhere” can be eliminated by the simple expedience of requiring all earmarks to be properly vetted in public hearings (proposal 3). Members of Congress are less likely to propose earmarks that could backfire through embarrassing public exposure of extravagance, personal interest, or intrinsic folly. An effective Congress requires disciplined parties, and party discipline depends on the leaders’ having an adequate supply of carrots and sticks by which to corral wayward party members. Prior approval by party leaders for earmarks (proposal 4) will keep party members in a stable and enduring coalition, ensuring both coherency and accountability to the public. The greatest practical problem with earmarks in the years before 2011 was the sheer volume. The 2006 highway bill, for example, included 6,350 earmarks, 15 for each House district. Such a huge number simply overwhelmed the committee staffs and calendars. Proposal 5 puts a reasonable limit on the number of earmarks added per year. Finally, it would also be reasonable to allow a very small number of earmarks each year that deviate from the rules embedded in proposals 1, 2, and 3. Party leaders should have the flexibility to add a very small number of relatively inexpensive earmarks on a purely ad hoc basis, in order to secure the marginal votes needed to pass critical pieces of legislation. G.K. Chesterton once defined an idealist as one who “wants to take the politics out of politics.” Opponents of earmarks should bear in mind that the struggle for good policy cannot be won if legislators cripple themselves out of a misplaced need to signal their superior virtue. 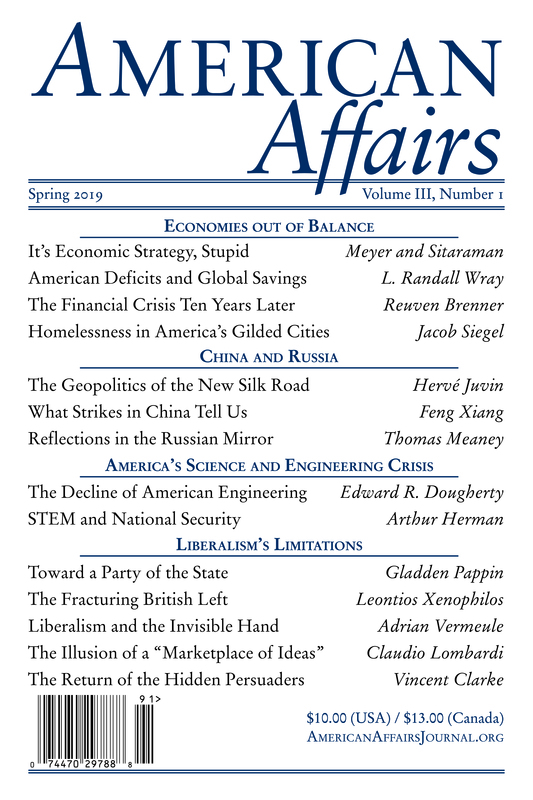 This article originally appeared in American Affairs Volume II, Number 2 (Summer 2018): 125–36. 1 Dennis C. Mueller, Geoffrey C. Philpotts, and Jaroslav Vanek, “The Social Gains from Exchanging Votes: A Simulation Approach,” Public Choice 13 (Fall 1972): 55–79. 2 Kenneth J. Arrow, Social Choice and Individual Values, 2nd ed. (New Haven: Yale University Press, 1972). 3 Richard D. McKelvey, “Intransitivities in Multidimensional Voting Models and Some Implications for Agenda Control,” Journal of Economic Theory 12, no. 3 (June 1976): 472–82. 4 William H. Riker and Steven J. Brams, “The Paradox of Vote Trading,” American Political Science Review 67, no. 4 (December 1973): 1235–47. 5 Thomas Schwartz, “Vote Trading and Pareto Efficiency,” Public Choice 24 (Winter 1975): 101–10. 6 Gordon Tullock, “Problems of Majority Voting,” Journal of Political Economy 67, no. 6 (December 1959): 571–79. 7 James M. Buchanan and Gordon Tullock, The Calculus of Consent: Logical Foundations of Constitutional Democracy (Ann Arbor: University of Michigan Press, 1962), 106. 8 CQ Researcher 16, no. 23 (June 16, 2006): 542. 9 John Hudak, Presidential Pork: White House Influence over the Distribution of Federal Grants (Washington, D.C.: Brookings Institution Press, 2014). 10 Robert Michels, Political Parties: A Sociological Study of the Oligarchical Tendencies of Modern Democracy, trans. Eden and Cedar Paul (London: Jarrold, 1915). Robert C. Koons is a professor of philosophy at the University of Texas at Austin.